This Saturday, two impressive college football teams will square off in what proves to be an epic battle. # 2 Florida State is favored over the 6-0 5th ranked Notre Dame. The Fighting Irish are clear underdogs in this matchup, and the history behind these two teams and prior matchups, seem to support this fact. Looking for the upset, Notre Dame coach Brian Kelly will surly be put to the test. They will need to play their best football yet. 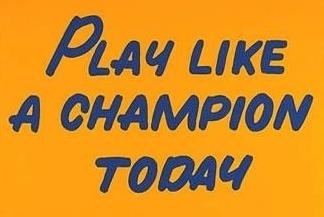 They will need to…..
My husband grew up watching Notre Dame and rooting for the Irish along with his father. 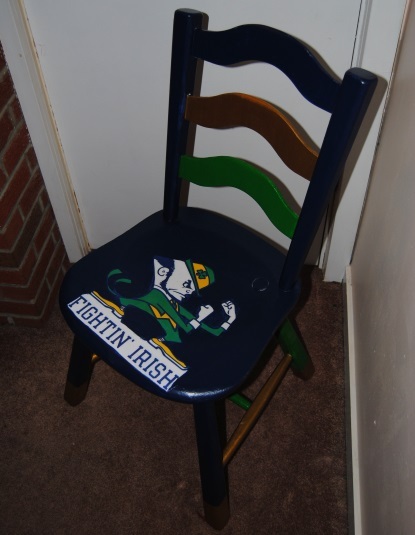 Like many teams Notre Dame has had its share of ups and downs through the years, but despite this my father in law’s love for his Irish never waned. Every game win or lose.. it didn’t matter, It was a celebration. It was Notre Dame Saturday! If you root for and follow a team you know that it becomes a part of your life and present during many important memories. My husband and I often think of our father fondly, and though he passed many years ago, Watching the games and following his favorite team brings us closer to him. I wanted to make my husband a special gift, and it never seemed like a better time than for one of their biggest games. 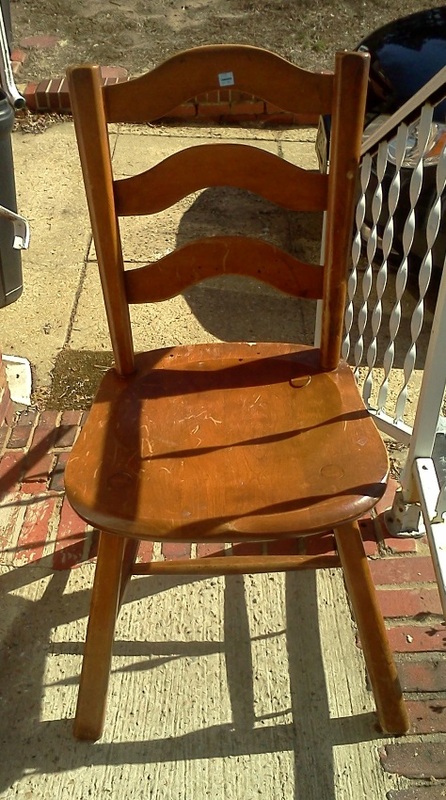 I picked up a lovely solid maple ladder back chair at Goodwill that had seen better days. It was priced under five dollars, and I was drawn to its design immediately. The chair has a stamp from a furniture company under the seat: Louis Albert and Company, Philadelphia PA. 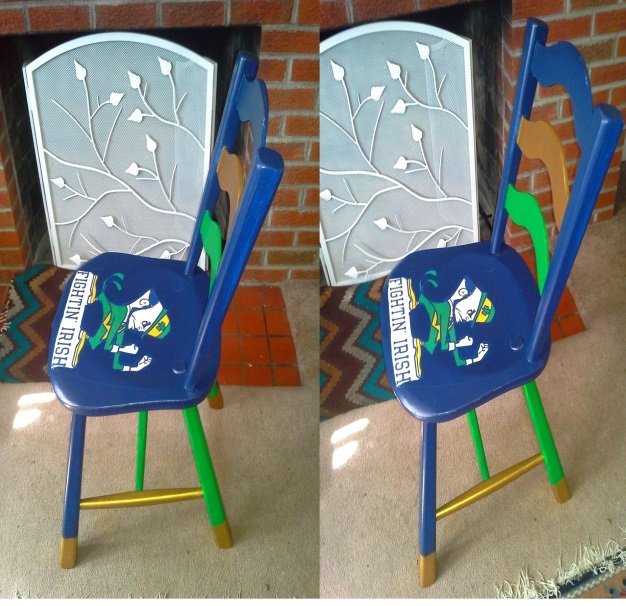 It seemed the perfect project chair, and with that the Fighting Irish Notre Dame chair, was born. 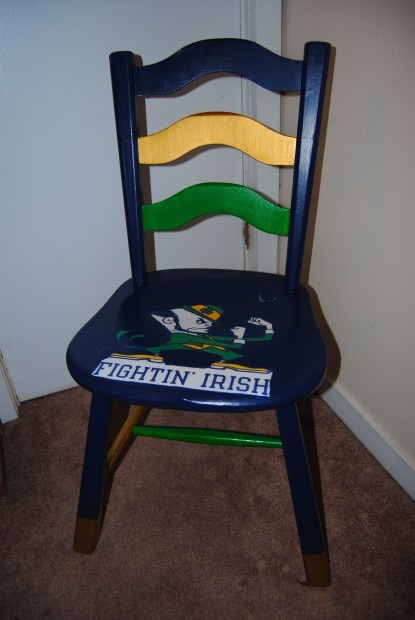 If you have followed my blog, you know I have a special place in my crafty heart for chairs. I am drawn to functional pieces of art and to me a chair embodies both these elements nicely. I printed out the college decal of choice on my printer. 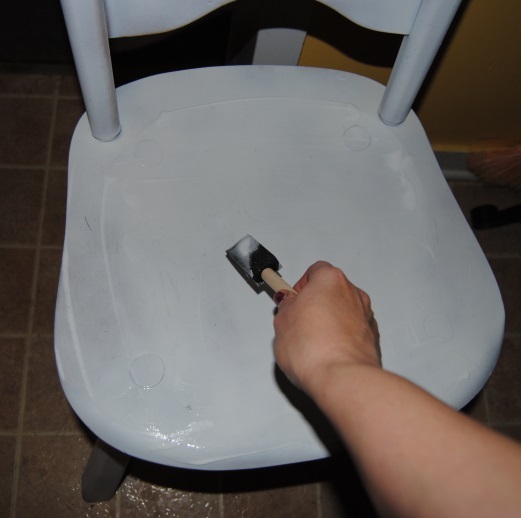 I then cleaned and prepped the chair with a white spray on primer. I applied Mod Podge to the seat with a foam craft brush. I then added the print, gently smoothing out any air bubbles with my hands. I added a thin layer of Mod Podge over the top of the print to seal it. 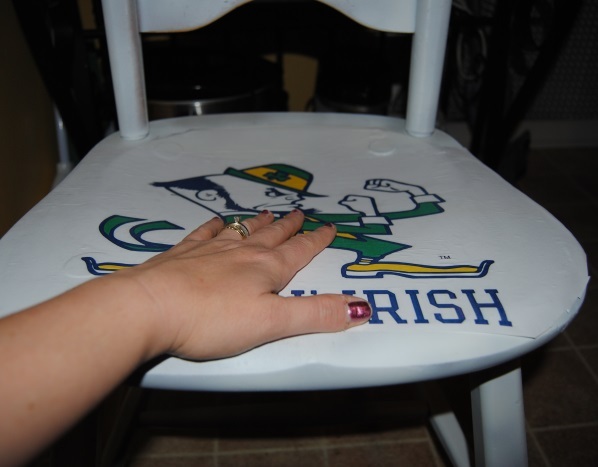 Once dry, I began the lengthy process of painting the chair. I used the team colors, gold, blue and green for the color scheme. It took several coats to obtain proper coverage. I carefully painted the area around the image, and although time-consuming, it made the image appear to flow with the seat. Because of the small areas, I decided to paint rather than to cut the image out. Adding Mod Podge before painting the paper prevented damage and curling. Two coats of Mod Podge over the painted area, properly sealed it. I decided to give the feet of the chair some character by adding the gold dipped legs. 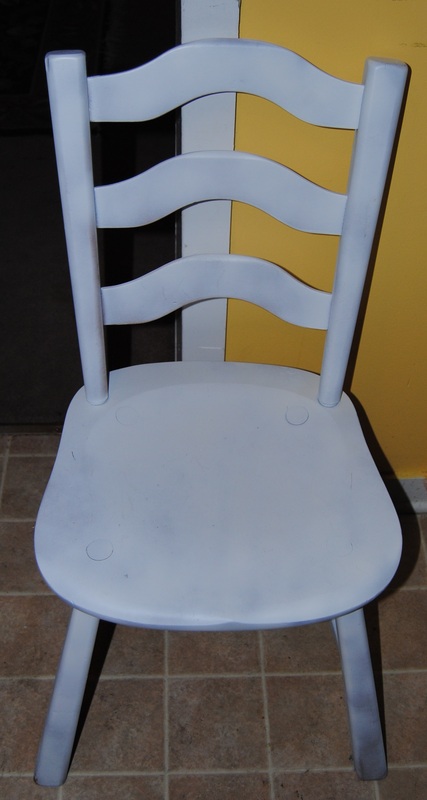 Once the paint was dry over the span of about two nights, I covered the entire chair in Mod Podge to seal the acrylic paint. 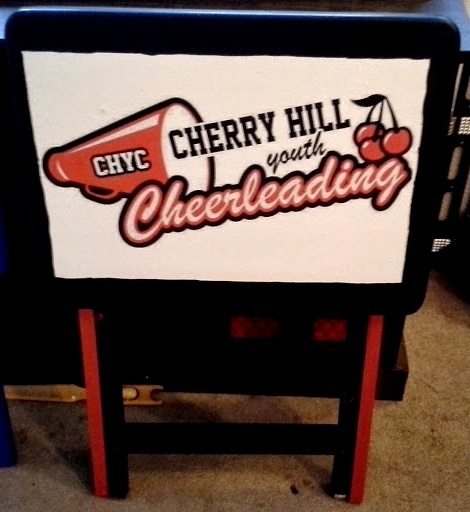 Now my husband has a special chair to sit upon and watch the game this weekend. Another Notre Dame Saturday of family memories with our own daughter, and a Fighting Irish college football chair to enjoy for many years and games to come! This holiday season, I decided to craft some gifts not only to save money, but simply for the sake of doing something different. When people stop by our house for a visit, they notice all the upcycled furniture and home decor items. 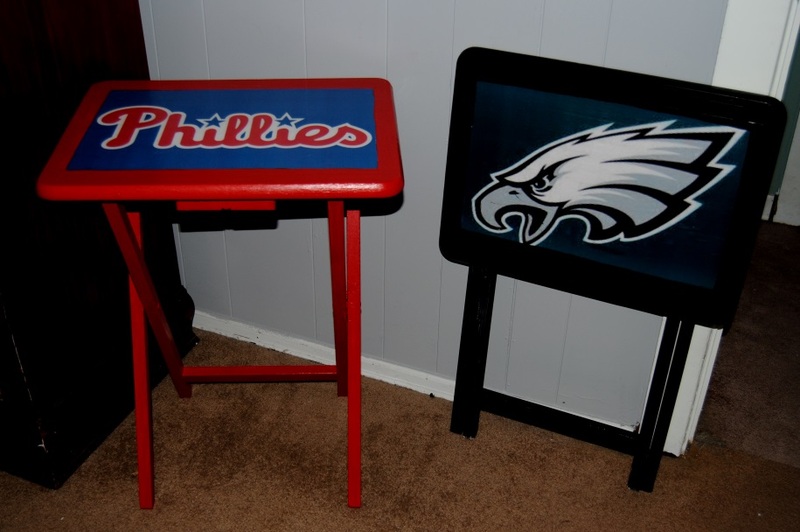 One of those items in particular, our Decoupaged Philadelphia Phillies TV tray gets a good deal of attention. For this reason, I thought tables such as these would make great gifts. Most folks have a set of these boring wooden TV trays at home. Despite the lack of design qualities these trays are very functional and often times serve an important purpose. Who hasn’t sat in front of the TV, and used one of these little trays to devour a late night snack, or simply use as a laptop computer table? I was in the thrift store and happened across four for sale. I snatched them up and was glad that I did! 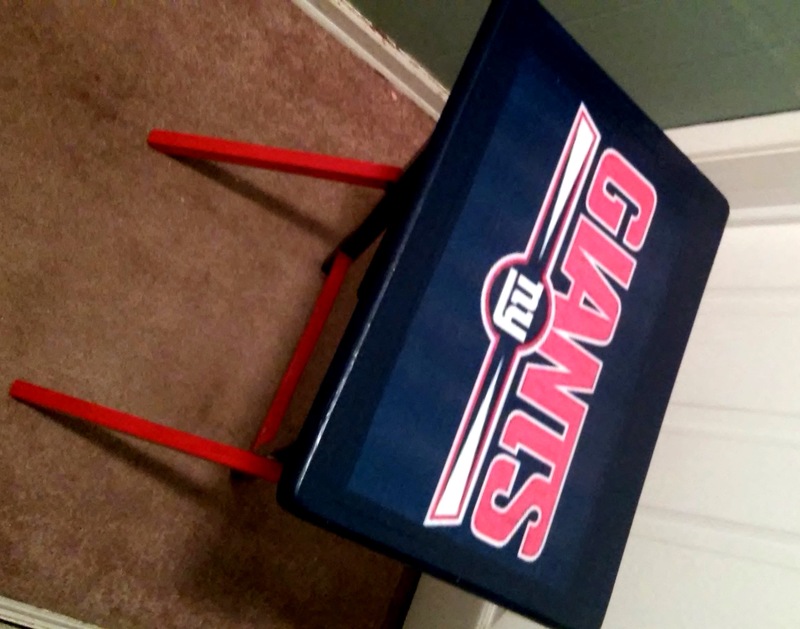 For three of these tables, I decided to use sports team themes, (the recipients are all sports fans, I will save what I did to the fourth table for a future post.) I found sports images online and printed them out on my printer. If you do not have an available printer, you can use decals, fabric, baseball cards, you name it! First, be sure and clean the table thoroughly. Once the table is clean and dry apply a white latex primer. To speed up this process, I purchased a spray on primer. I took the tables outside and applied two coats to each table, allowing each table to dry thoroughly between coats. Table number one was for a Washington Redskins fan. 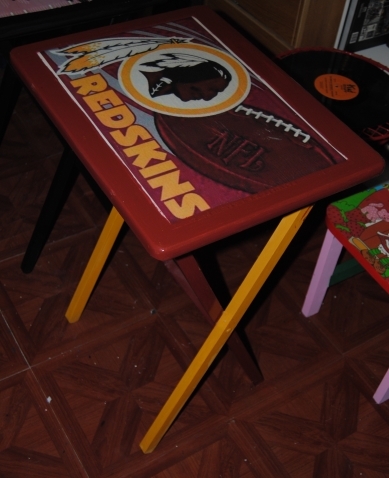 I painted the table with acrylic paint in the Washington Redskins colors, gold and a deep dark red, almost burgundy color. Once dry, I used Mod Podge to carefully apply the printed image to the table surface. 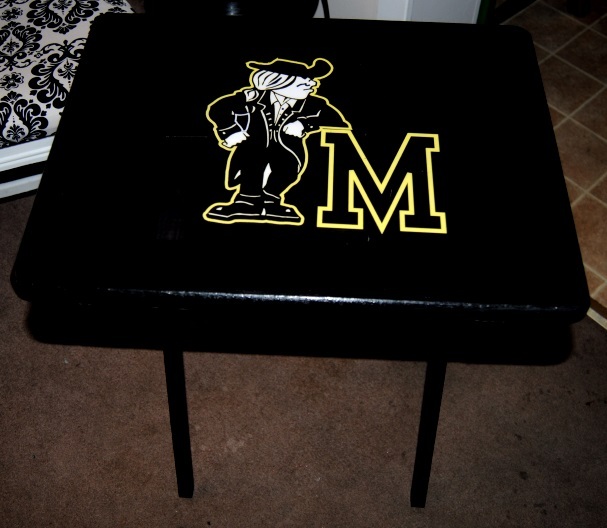 I then applied Mod Podge over top of the print and covered all the painted areas with Mod Podge to seal the table. The Mod Podge on its own is enough to seal the table, but since I was giving these as gifts, I added a coat of a polyurethane clear coat sealer for added protection against moisture and heavy use. Be sure to be mindful of the parts of the table that fold up. (“On the Upcycle” mistake alert!) 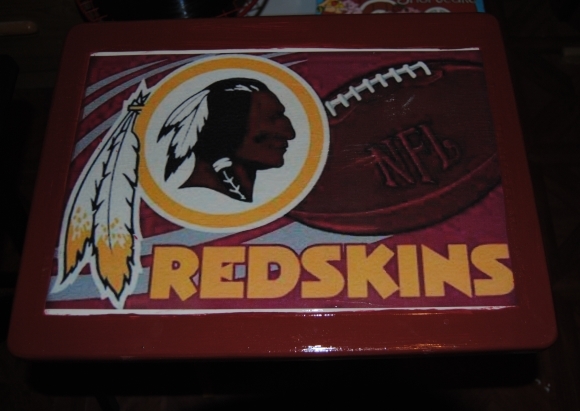 If any Mod Podge or Polyurethane drip into these areas and dry it can be problematic if you try to open the table and it “sticks” This happened a little with the Washington Redskins table and caused the paint to “chip” a bit in the area that the legs were slightly “stuck” together. 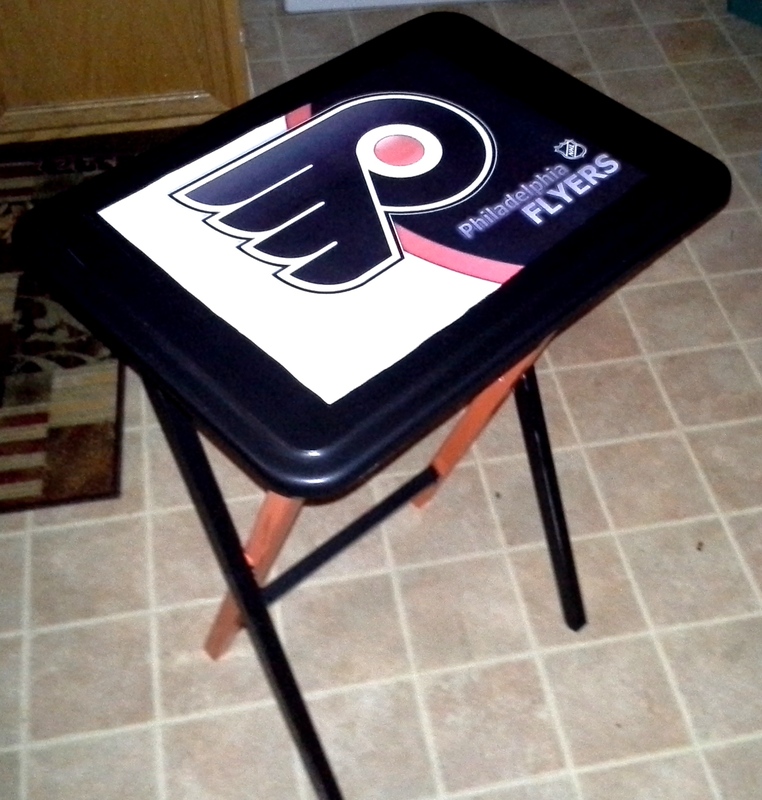 Despite this minor flaw, the table turned out well! Before giving the gifts, I inspected the tables carefully, touching up any areas that needed it. They seemed to be a big hit with those who received one. It also marked the first time I attempted to work on multiple projects at the same time. My husband and I have been working on each room in the house, cleaning reorganizing and coming up with new ideas for old items. One of the areas that needed attention was our basement/laundry area. Our basement is damp and unfinished and keeping it clean is quite a challenge. It also serves as our laundry area. 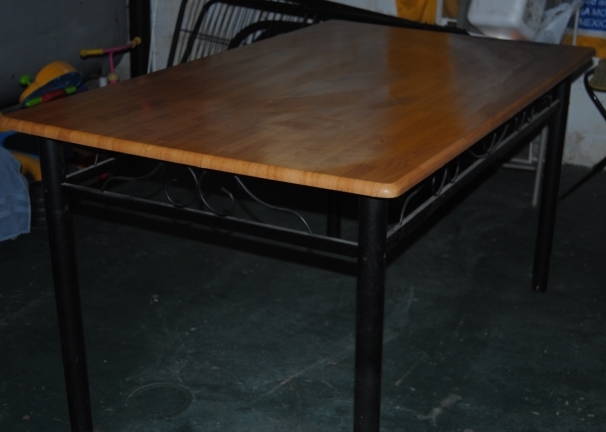 We have a table in our basement we used in our kitchen for many years. We now use the table for folding and basement storage. When we moved into our home six years ago, our kitchen was too small for such a large table so it was delegated to the basement. I am blessed to have a husband that helps with the household chores, especially the chores I hate! One of these chores is doing laundry and he graciously does the family laundry every Sunday evening. He is also a huge Phillies fan through good times and bad. 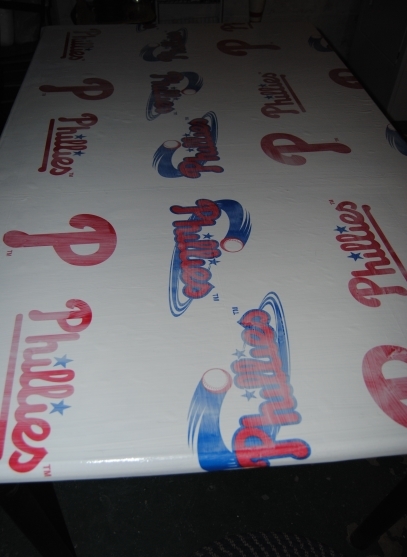 While we were grocery shopping, we came across a Philadelphia Phillies plastic table-cloth in a bargain bin. It was priced right at $1.69. 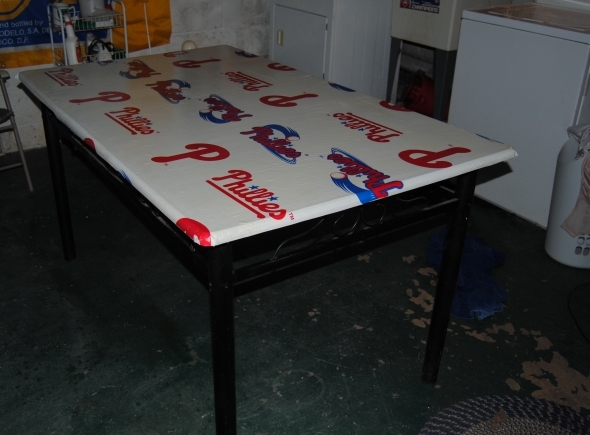 I thought it would be great to redo the grungy basement table into a Phillies fan table, and a great way to thank the hubby for all of the laundry he does! My only concern was that the table cover was plastic. As stated in previous posts, Mod Podge doesn’t always adhere well to certain plastics. I thought this would be a great experiment as I had never used a plastic table-cloth for decoupage. 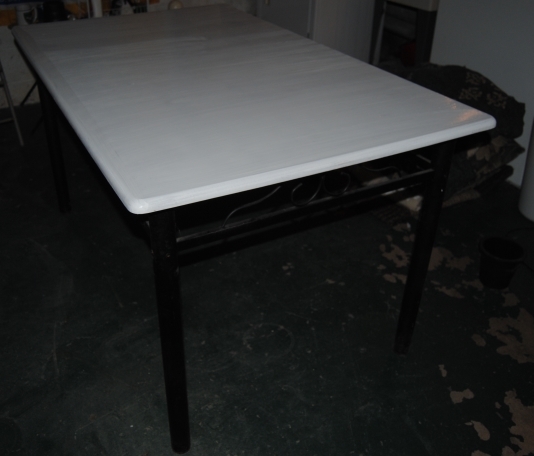 First, I cleaned and painted the table surface with a white latex primer. This was important because the table cloth was white and the brown surface could potentially bleed through the white table-cloth. 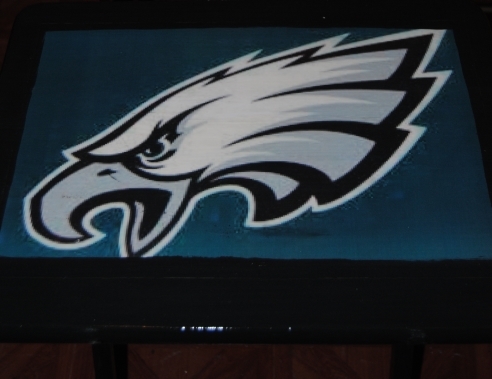 Once the paint was dry, I generously applied Mod Podge to the table surface with a large paintbrush. I carefully layed the table cloth on top of the Mod Podge table surface. This was the most challenging aspect of the project as the table cloth material is thin and prone to wrinkles and air bubbles. The table cover also is spread across a larger surface area. 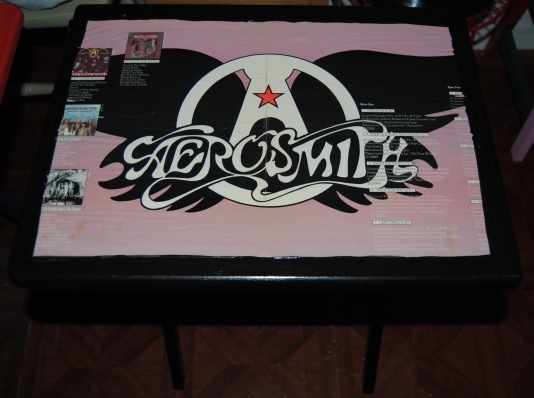 I smoothed out the table cover as best I could and applied Mod Podge over the top of the cover and allowed it to dry. I used scissors to carefully trim away the excess table cover hanging over the edges. I used two coats of a polyurethane clear coat to seal the table surface, I allowed the first coat to dry for 4 hours and the second was left to dry over night. I applied additional Mod Podge to the edges to prevent any minor curling. This project was certainly not without its challenges, but despite these I think it turned out great. The hubby may have lost his sports room to a playroom, but his laundry room is on its way to becoming a surrogate man cave! Before our daughter was born, my husband had the ultimate sports man room. It was filled with sports memorabilia, and a fully stocked bar. We hung out in there regularly watched movies laughed and joked and even kicked back a few drinks. Now, a new kind of laughter fills this room. It is no longer the ultimate man room, but it IS the ultimate little girl’s playroom. My husband and I discussed doing something special in the family room for our daughter Erin. We both liked the nursery wall mural and how it turned out. Sure, we could have decided on a mural of princess’s and castles, but I wanted to do something different and also keep true to the original theme of the room which was sports. One of her favorite toys is her Phillie Phanatic Pillow Pet, which ultimately gave me the idea. I also wanted to do something for the hubby. He was more than happy to give up his room for his daughter, but I wanted to thank him too, after all he is a huge Phillies fan! 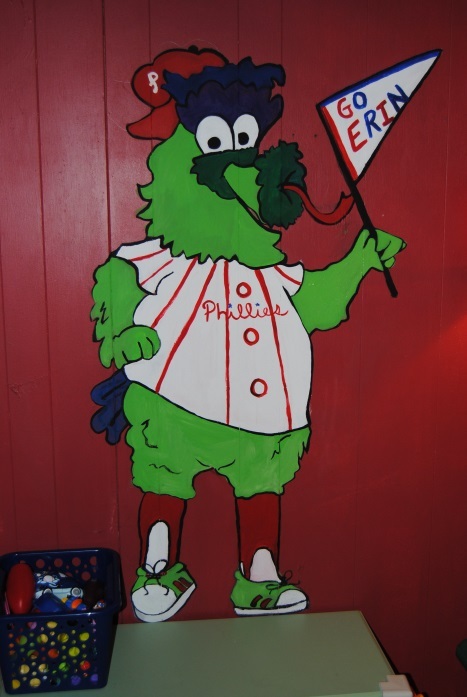 I searched the internet for a good example of a Phanatic image I wanted to use as a visual. I often draw through visually studying a picture before I begin. I usually use a pencil to outline where I am going to paint. I found it easier this time to simply draw the lines with a fine brush and black paint onto the wall. If I made a mistake, I used a magic eraser to wipe away the paint. 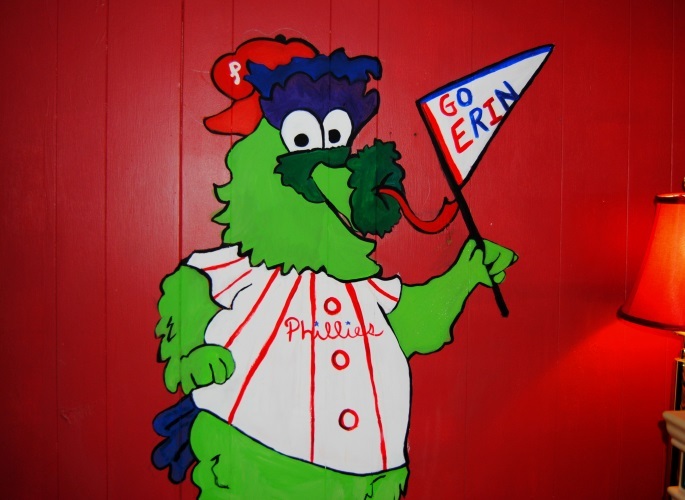 (Magic Eraser does not work on a flat painted wall) I thought it would be cute to have him holding a pennant with ” Go Erin” on it. I used acrylic paints and applied about 3 coats total. The mural measures a little over 5 feet tall. Hopefully, it will be a good luck charm this season and beyond! The Phanatic replaced “Philadelphia Phil” and “Philadelphia Phillis”, a pair of siblings dressed in 18th-century dress. The Phanatic debuted on April 25, 1978, at The Veterans Stadium, when the Phillies played the Chicago Cubs. His mother, Phoebe Phanatic, occasionally appears with the Phanatic. My husband and I were sitting down last Sunday after our little one had finally gone to bed. We were watching our favorite show, Game of Thrones. It has become our Sunday night ritual and is easily one of my favorite top five shows of all time! Most of our house is now toddler proof, so we are lacking a coffee table in our living room as well as side tables. We pulled out the old TV trays we had up in the attic and they were perfect to put our popcorn and drinks down on, but that’s about all the good I could say about them. To me, they were just plain and ugly! I said to my husband that I should give the tables a makeover. We have three total. The original plan was to re-create the baseball card decoupage table I had seen on Pinterest, but the hubby didn’t want to part with any of his old baseball cards and I can’t say that I blame him. 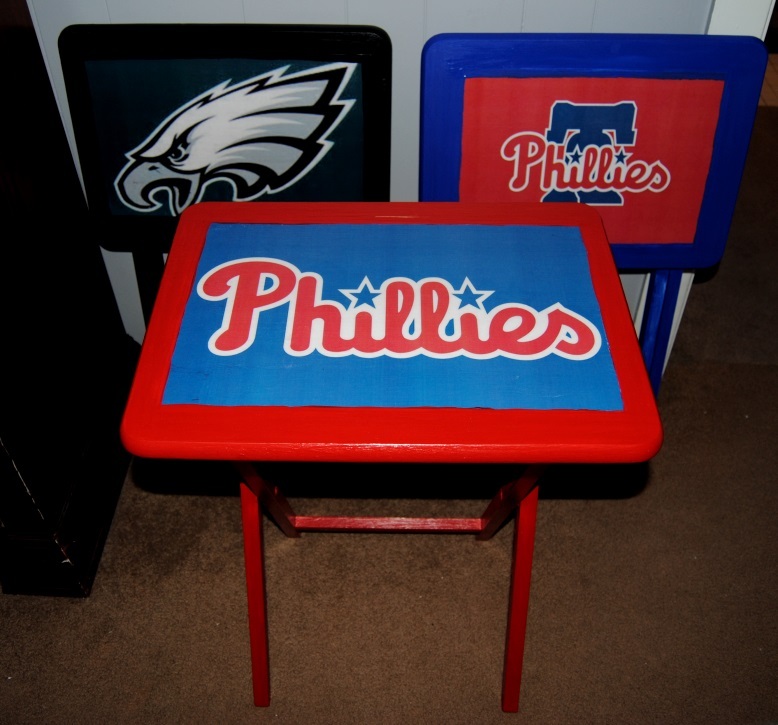 So, we decided I would make a TV tray dedicated to my husband’s favorite sports team-The Philadelphia Phillies. There are a lot of great, free graphics on the web. If you have a good printer at home and some larger paper you can find just about anything online to decoupage. (Ink jet printers not recommended as the ink will often times run) The limits are endless on what can be used so keep that in mind. 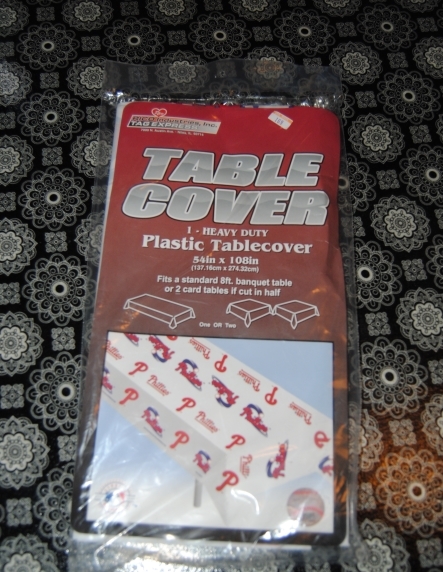 Old sports linens, place mats, wrapping paper, sports decals-just about ANYTHING can be used to decoupage, so let your imagination run wild and always think outside the box. First I cleaned the table, removing any dirt or dust. I used a latex primer to prime the entire TV tray. 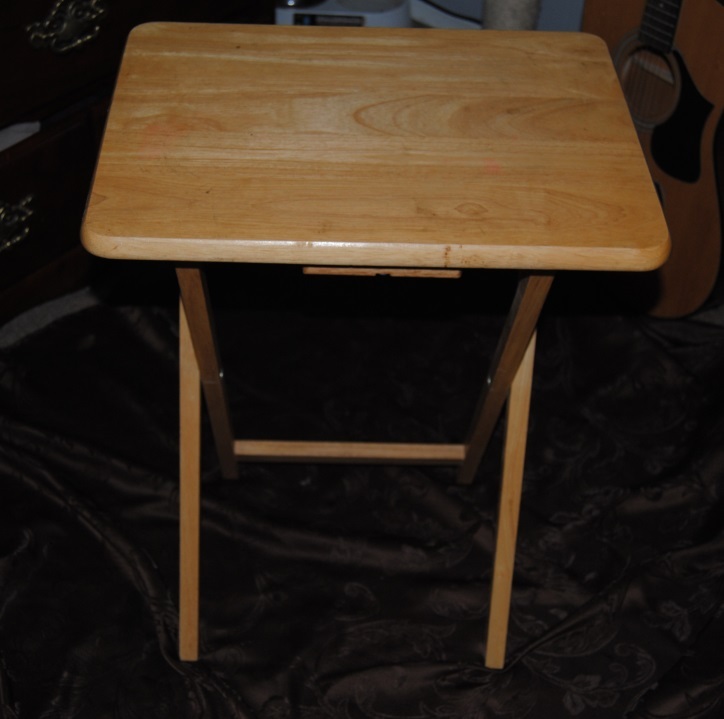 Once dry, I used Acrylic paint and painted the legs and underneath as well as the table top edges. I used Mod Podge to glue the print to the table top carefully smoothing out any air bubbles. Once dry I used three coats of Mod Podge Matte to seal the piece letting the table dry completely between coats. I was actually shocked as to how well it turned out! 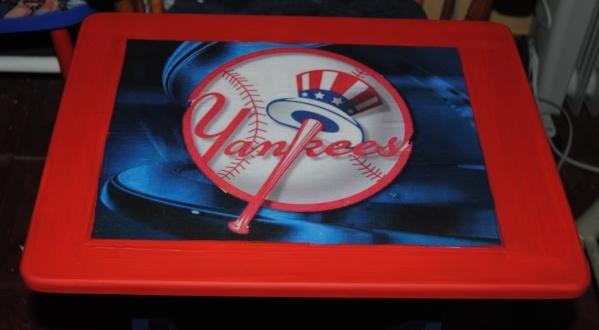 I was so pleased I decided to do the other two TV trays as well in the hopes of selling them. We plan on purchasing our flea market space one weekend this summer in the hopes of raising some money to take a much needed family vacation. Sesame Place or bust! 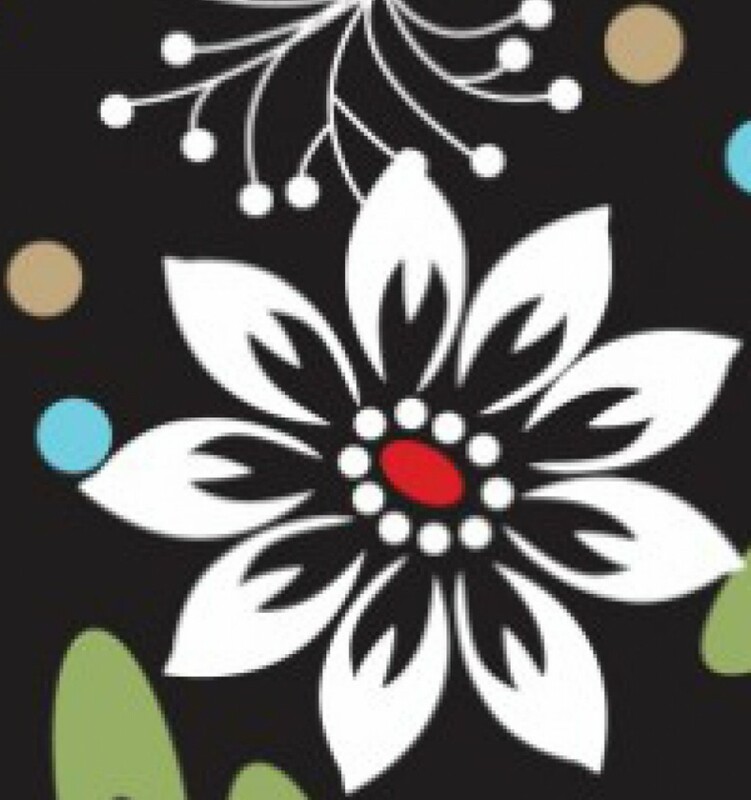 An item to decoupage (poster, print, linens, decals, place mat or anything you can dream up!